In an old barber's shop on a Marylebone backstreet there is an enclave of strangeness called the Gallery of Everything. Inside is the art of 'outsiders': the frenetic creations of hermits and eccentrics, religious fanatics and loners compelled to build, carve and paint. 'Outsider art' is an unsatisfactory phrase. It is marginalising, remarking on the otherness (the subtext being the weirdness) of the artist, rather than reflecting the nature of their work. But its meaning does fairly accurately suggest that the artist operates beyond the confines or cultural norms. These artists are often untrained, unsculpted by the opinions of teachers or gallerists. People who build gigantic castles in their gardens, pin poetry on trees and bang gongs to serenade the forest, who move into the attic so they can turn their entire house into a work of art. Outsider art has roots in the so-called 'art of the insane'. In the 1940s, French artist Jean Dubuffet started collecting works by prisoners, asylum-dwellers and children in a bid to prove that art existed beyond galleries, museums and norms of high culture. What Dubuffet termed 'art brut' would morph decades later into 'outsider art'. James Brett (pictured at top) has been drawing attention to these sorts of artists with his celebrated Museum of Everything (MofE) since it first opened in Primrose Hill in 2010. 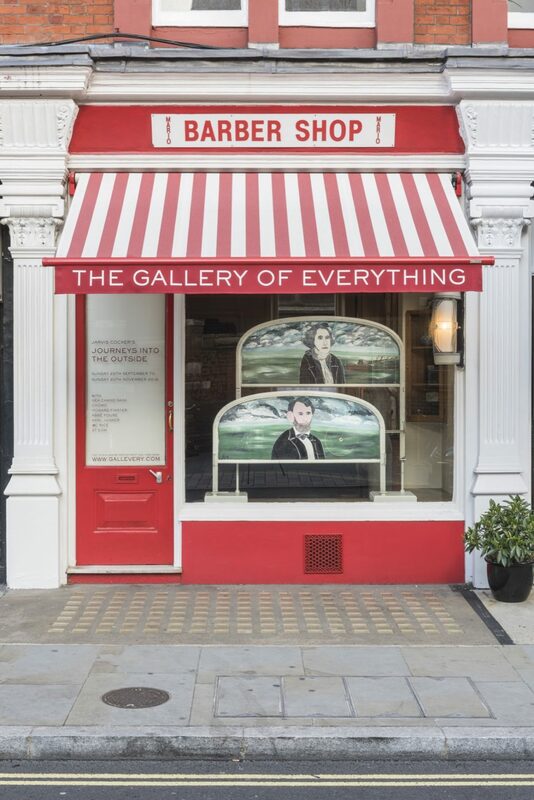 But unlike the MofE, his new venture, the Gallery of Everything, is a commercial enterprise: selling the work of unconventional artists to London collectors and trying to invigorate a market for this stuff in Britain. Profits are all poured back into the MofE, which has been touring the world, last popping up in Rotterdam in May. The current exhibition at the Gallery of Everything is partly the result of happenstance. When Brett was on holiday he bumped into an old acquaintance: Jarvis Cocker. Now, Cocker might have famously sung about a woman studying sculpture at St Martin's college, but he actually studied there himself, graduating with a degree in film and fine art in 1991. During his studies, the singer wrote his thesis on the kind of quirky, anti-establishment art that Brett showcases – earning the second-lowest mark in the year for his trouble. But a couple of platinum-selling albums later the Pulp star was able to turn his thesis into a three-part documentary series for Channel 4. Journeys Into the Outside with Jarvis Cocker was broadcast in 1999 and followed the singer as he drove around the world meeting and being bamboozled by wonderful and apparently purposeless creativity. "You don't have to be mad to build a large-scale visionary environment, but it helps," Cocker remarked at the start of the series. Nearly two decades on, seven of the artists featured in the original programme have work on display at the Gallery of Everything. Entering the small barber shop (complete with original striped awning, barber's chair and a smell of decades of Brylcreem), you immediately encounter the distinctive work of Howard Finster, one the world's most renowned outsider artists. Finster, who died in 2001, was regarded as a folk artist. 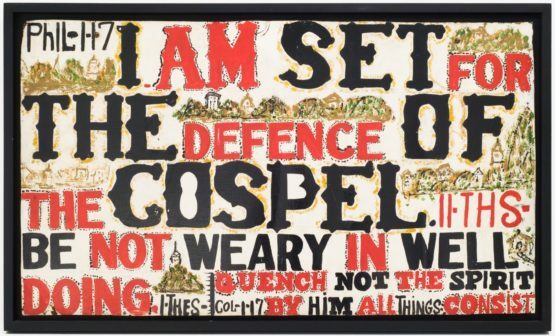 The Georgia-based painter worked as a baptist minister and bicycle repairman, but he began making sacred art after claiming to see the vision of a face on his finger who told him to do so. This was just one of many visions Finster reported, and the guidance prompted a burst of creativity that would lead him to produce more than 40,000 artworks – half of which were made in the final decade of his life. Everything he owned, every surface, scrap of wall, car, furniture, clothing was inscribed with faces, words and visions. Despite its outsider status, Finster's work is widely collected in America. It graced the covers of Talking Heads and REM records. Paradise Gardens, in Summerville, Georgia, a kind of gigantic, dilapidated church/sculpture park which he built to house his thousands of works, has become a place of pilgrimage. 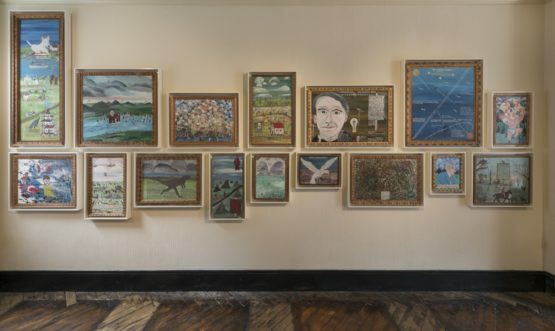 Inside the gallery, a slice of Paradise Gardens has been recreated: the colourful, primitive paintings inscribed with sometimes profound, sometimes illiterate, often surprising and beautiful phrases, are hung close together, almost haphazardly. Even the frames have been handmade by Finster who, legend had it, slept just 15 minutes a day. 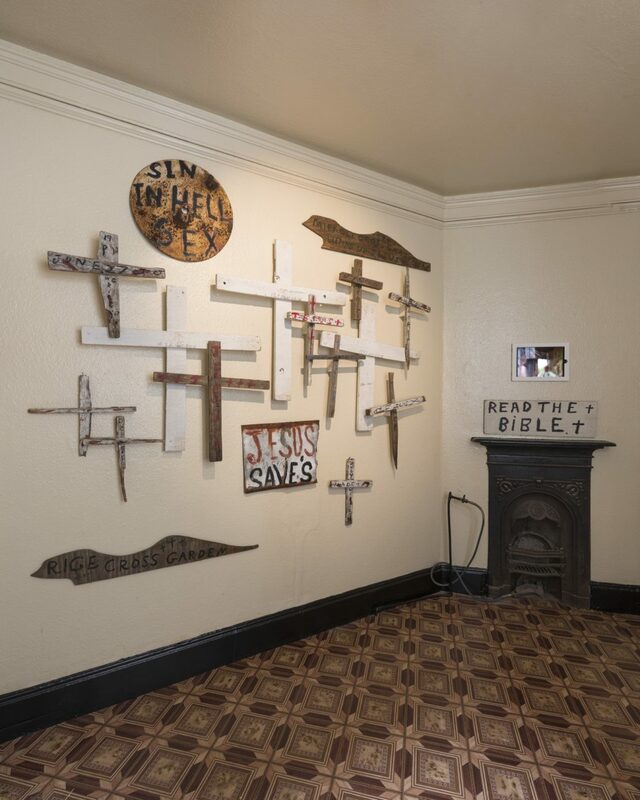 In the small back room, hastily crafted crucifixes by another religious American outsider, William Carlton Rice, are tacked up on the walls along with the sober warning: "You will die." (Rice made thousands of these crucifixes.) Also there are fragments of intense carvings by Karl Junker, who confined himself to the attic of his Junkerhaus so that he could turn the rest of the building into a life-size doll's house. 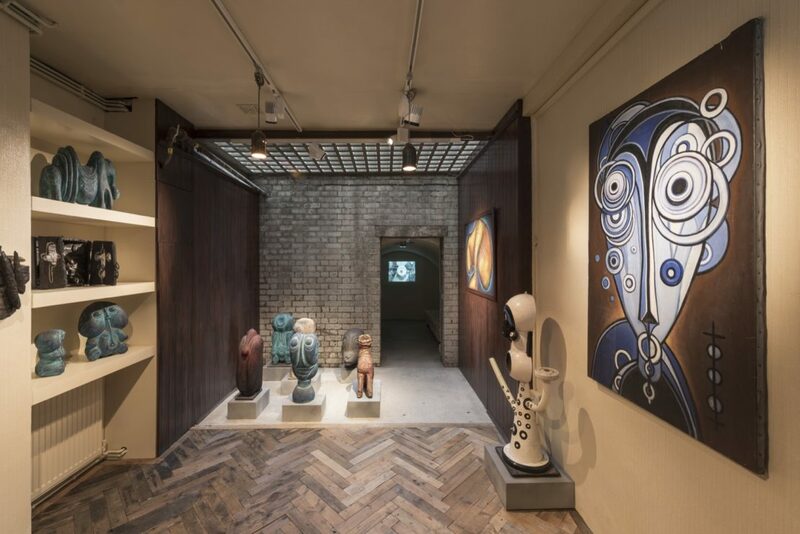 Downstairs are the strange, organic burnt-wood animals and totem poles of Chomo, a French polymath who rejected ordinary life, his artistic training and his family, to retreat to the forest outside Paris. Chomo didn't consider himself outside culture, but beyond it. He refused to take part in Cocker's series, which he described as "fuckwit cinema", after he found out it wasn't going to be just about him. All of the work on display carries the raw energy of obsession. Much of it can be compared to tribal, primitive art. Each piece is fascinating. But the backstory, each work's relationship to the characters who created them is key, even if Brett argues: "In this day and age, the term outsider doesn't mean very much: everyone is a sort of insider or outsider. Surely there's a better way to define the makings of those whose aim is not primarily commercial or public?" The current exhibition will run until 20 November. After that, it will be adapted to include a special Christmas showcase of work by Wilson Bentley, one of the first photographers of snowflakes. Vermont-born Bentley, who died in 1931, perfected a technique of catching snowflakes on velvet and capturing their intricate and extraordinary shapes before they melted. 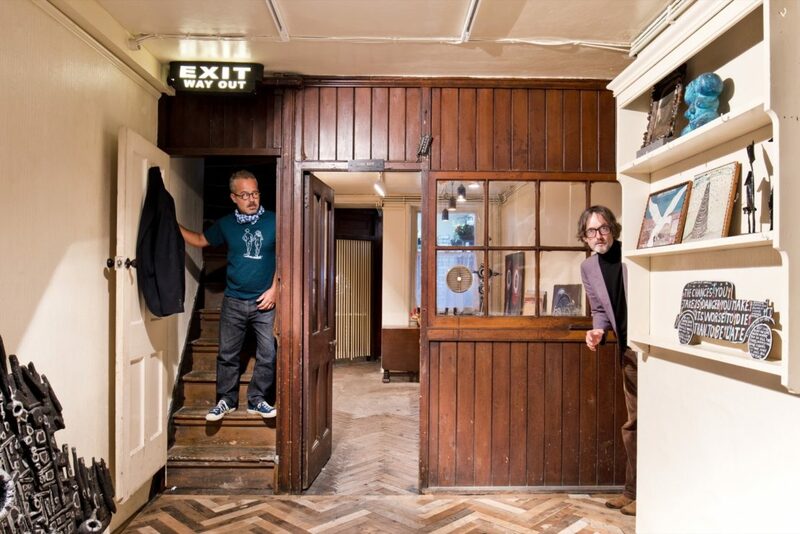 Jarvis Cocker's Journeys into the Outside is at The Gallery of Everything, 4 Chiltern Street, London, W1, Tue-Sun from 11am.